The Healthy Eyes for Successful Education project was implemented initially in the elementary and secondary schools of Thumana beginning from July 2017 to support school children of this area in preventing or detecting vision problems that might affect their efficiency in the learning process. 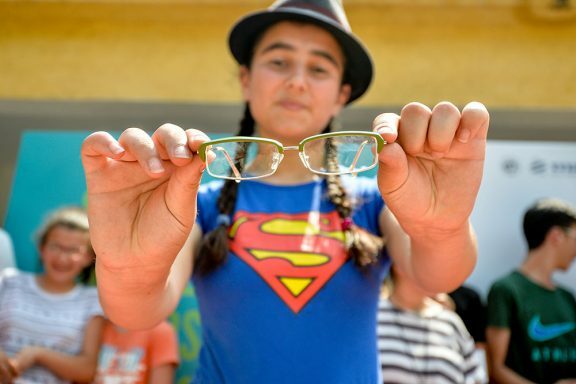 The first phase of the project diagnosed around 400 children with a twofold outcome: increased levels of awareness on vision health and direct assistance with glasses for those affected by vision malfunctions. Due to its success, the project extended in the March-June 2018 period to four other schools in the villages of Shperdhet, Fushe Mamurras, Borizana and Picrraga. A total of approximately 2000 children were subject to the diagnosis and awareness raising sessions, whereas around 570 children and teachers were equipped with optical glasses. This initiative was implemented in cooperation with the Social Service Center DAER that provided the medical staff and social workers who assisted children in this process. Due to the big interest that the initiative attracted among teachers and parents, the project also extended direct support to several teachers from the four schools of the local communities and the children of the community of Brret which is located in the area where the company operates. The project echoed also in national media through a dedicated interview with implementing partners in the Top Channel media outlet. This initiative was launched in the framework of the Corporate Social Responsibility Action Plan of the company. ANTEA is firmly committed to contribute to the improvement of the quality of life of communities where we operate implementing similar projects.